There was no grey clouds nor could I hear the pitter patter of drizzle on my balcony. Not a single person wrapped up in a cozy jumper nor smoky fog on our windows. Instead the blue sky was devoid of a single cloud to protect from the scorching sun. I could see clearly for miles and miles into oblivion, people walked in shorts and T shirts at the park. Yes, I could spot plenty of umbrellas but no rain! Only to protect them from the wrath of the sun. As I stepped outside, the humidity caused my glasses to instantly fog up. I knew then and there that summer was still here, with a vengeance. Yet, I still needed to be comforted and held. To feel cozy and warm- from the inside. I needed a splash of color, a splash of ruby, a splash of happiness. We made this whilst Akber was travelling. As I've mentioned before, we are not big soup eaters. However, there are times when only a soup can fill a void, when only soup can cheer you up. And that's exactly what this soup did for me. And for Maryam. We ate this with some crunchy garlic bread on the side and a sprinkling of fresh herbs crowned the soup beautifully. Feel free to substitute the herb of your choice and whatever juicy tomatoes you have in season. I have also made a version of this soup with hot water in the place of chicken stock. 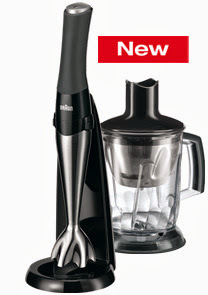 Today I'd like to give away a Braun Multiquick hand blender. I used it to blend my tomato soup and loved the results. The best feature for me was the fact that it was cordless which meant I could blend my soup in the pan rather having to transfer it into the blender (and also the fact that my soup didn't splatter everywhere). The blades are wonderfully sharp and it has several attachments for chopping and ice crushing. PLEASE REMEMBER: Leave a separate comment for EACH of your entries or only one entry will be counted. Good luck. The giveaway will end on Monday 29th September at midnight. One winner will be selected at random from a valid entry and be sure to leave a valid email. You will need to claim the prize within 48 hours or another winner will be chosen. Note: I received this product from Braun but all the above views are my own. Heat oil in a saucepan and add onion. Once it starts to get translucent, add chopped garlic. Stir for a few seconds before adding tomatoes, basil powder, chicken stock, sugar, salt, pepper and chili flakes. Simmer half covered for about 40 minutes. Keep an eye on the stock- of it starts to dry up, you can add more. Pulse the broth using a hand blender until smooth. Garnish with parsley and serve hot with garlic bread. I like Sips and Spoonfuls on Facebook. I subscribe to Sips and Spoonfuls via email. This soup looks so warm and comforting that I'd love to try it in spite of the crazy heat outside. Soup just screams "Home!" and I kind of miss it. Facebook follower for quite a while now. I follow you on Twitter! Love the soup and your photos are stunning! Also signed up for email subscriptions! And I also followed you on facebook! And I´m also following you in facebook already! And I left the message on twitter too. So I´ve already done the 4 steps and leave a comment for each one of them. 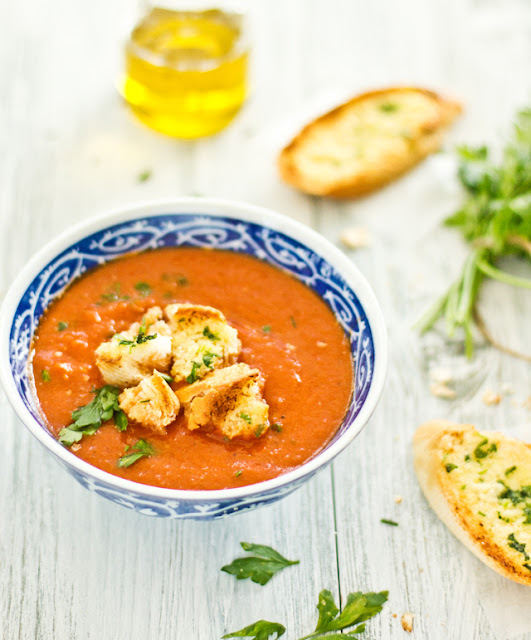 I did it because this tomato soup is similar to our Spanish gazpacho. Good Luck to everyone!!!. Great prize and your tomato soup looks delicious! I have Subscribe to Sips and Spoonfuls by email. I have liked Sips and Spoonfuls on Facebook. I'd love one of these! Beautiful soup, too! I am a fan of Sips and Spoonfuls on Fb. Subscribed to your blog through mail. The soup, garlic bread and the pictures all are beautiful! I subscribed to Sips and Spoonfuls! 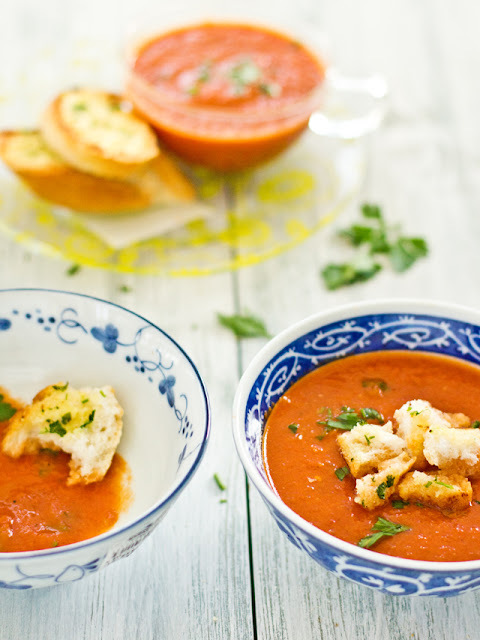 Lovely soup - gorgeous for an inbetween seasons weather! And I have subscribed via email. Excited to be getting a dose of your yummy recipes and photographt to my Inbox! Gorgeous pictures and a delicious soup S. Love the colours, and the blue & whites too! Beautiful!! Worldwide?? Yes please! Been following you on twitter too .... LOL! 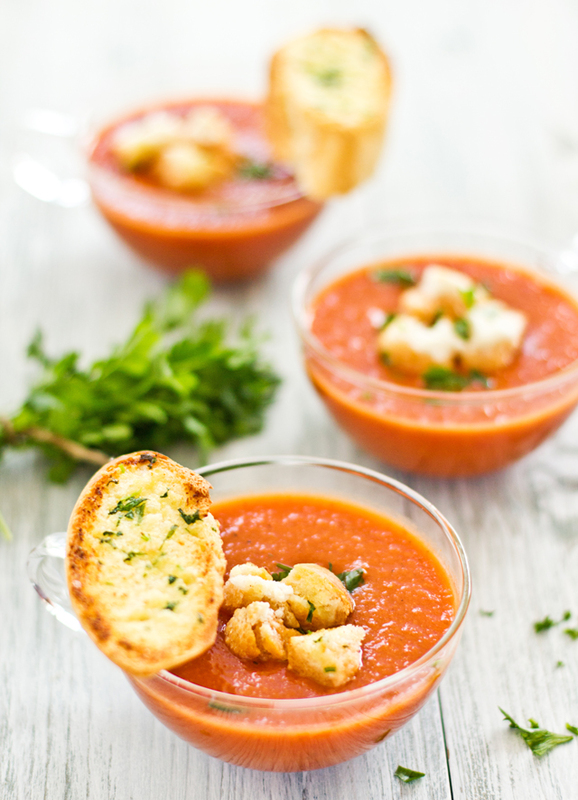 Tomato soup is hands down my absolute favorite - hooray for soup weather! Your soup looks amazing Sukaina, as do your beautiful photos!!!! So warming and comforting. Thankfully it's still soup weather here, just barely, because I love soups. I will have to try a tomato soup because I've been seeing so many beautiful tomato soups recently. I follow @sipsandpoonful on twitter! I like your FB page ! I tweeted from @chandhanarao " I entered to win a free Braun cordless blender via @sipsandspoonful http://tinyurl.com/3zkfhx2 #giveaway "
i have followed u on twitter. I have liked sips and spoonfuls on FB long long ago in the earlier days. I am one of ur earlier subscribed fans via e-mail too Sukaina. So i am on twitter at last, courtesy of Sukaina and my first twitt to the world is :I entered to win a free Braun cordless blender via @sipsandspoonful http://tinyurl.com/3zkfhx2 #giveaway !!!! InshaAllah, i wish i win it. Hi already follow you on Twitter and Like you on Facebook so I have retweeted the post and competition. Many thanks. It's been a while since i follow you by email! And I just twitted "I entered to win a free Braun cordless blender via @sipsandspoonful http://tinyurl.com/3zkfhx2 #giveaway"! liked you on facebook a long time ago...btw loving the soup! im in dubai as well and anticipating a cooler weather...this summer seems never ending! Following Sips and Spoonfuls on Facebook now. I just followed you on facebook. I follow @sispandspoonful on Twitter. I follow Sips and Spoonfuls on Facebook. I tweeted (@ziziadventures) the sentence: "I entered to win a free Braun cordless blender via @sipsandspoonful http://tinyurl.com/3zkfhx2 #giveaway"
I subscribed to Sips and Spoonfuls by email. I am a FB fan, of course! I subscribe via email now! Following @sispandspoonful on Twitter @lyndacooks. Following Sips and Spoonfuls on Facebook as Lynda Clark. Email subscriber to Sips and Spoonfuls. An amazing looking soup! It looks mouthwatering. I foolow you on Twitter. I subscribed to Sips and Spoonfuls by email. Great giveaway! I already follow you on twitter. I live in the middle east too and can resonate with your posts ! Great Blog. 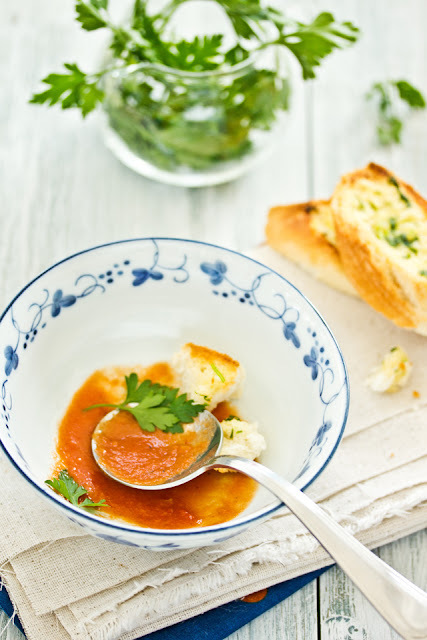 What a stunning post, Sukaina - lovely recipe (tomato soup with crunchy garlic bread sounds wonderful), beautiful photos and lovely writing. I like Sips and Spoonfuls on facebook! I need one of those immersion blenders, they look so convenient. What a beautiful soup and makes me want to soak up every last bit with a nice piece of bread. Following you on Twitter of course. You know that I follow you and love your site. :-) Most importantly, I love this tomato soup. Looks scrumptious! Your soup looks wonderful, Sukaina!! As always your photos are so gorgeous and I think that soup looks so comforting! I liked you on Facebook !! The color of the soup is so very vibrant! and I could do comfort with a tomato soup anytime. LOVE all your photographs Sukaina, the hints of blue really bring out the color of the food. and I love that ladle. So glad I found this blog now following on twitter! Just liked your Facebook page! Just subscribed to your blog by email!! Yay! I like you Facebook page! I subscribed by email as well! I'm now following you on Twitter...Please pick me! This soup looks like it would hit the spot right about now...I've got to try it! I liked you on fb :) Would love to win the blender!! 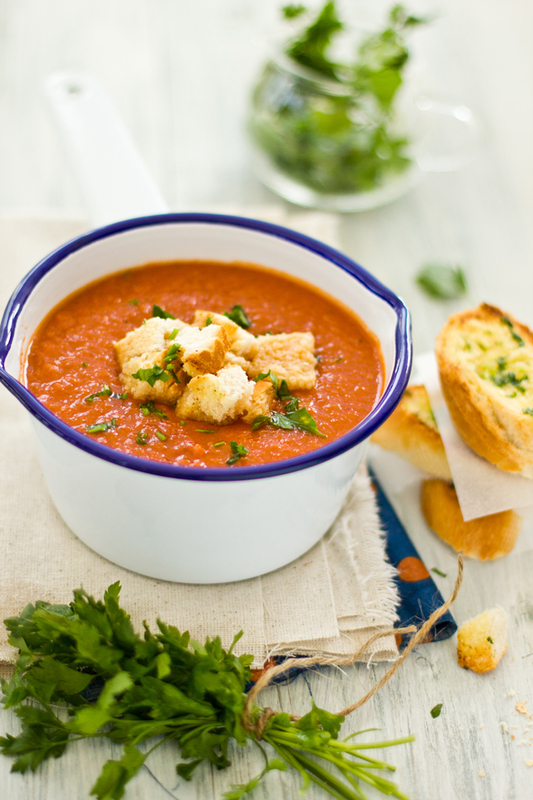 The tomato soup looks amazingly beautiful. I have liked Sips and Spoonfuls page on facebook. I have subscribed to the emails. I have followed @sipsandspoonfuls on Twitter. I tweeted the tweet! Yay contests. I have followed @sipsandspoonfuls on Twitter! By the way, this soup looks AMAZING. It looks creamy and yet there is no dairy! I can't wait to make this!! Can't agree more with you on the scorching sun, foggy glasses, humidity and lack of grey clouds (even grass fires!) here in TX too.. At times, it can be as frustrating as a sunless winter! BTW, This is the most beautiful Tomato Soup I have seen in recent times. You are definitely outdoing yourself in each and every post dear!